It's a curious thing whenever I hear so many Marvel Cinematic Universe fans 'call' for a Hulk film when, technically speaking, not only do we have a Hulk film already, but that said Hulk film is the second film of this never-ending franchise. Our favorite green monster has actually had two films long before the likes of Thor or Ant-Man came bounding up and down. One can discount Hulk since that one wasn't part of the MCU. The Incredible Hulk, however, is part of that universe, so this becomes a fascinating story of willful ignorance, of 'out of sight, out of mind', of denying reality/truth to keep a narrative going. As fanboys/girls continue to revel in their expansive fantasy world, where even such trivial characters as Hawkeye and Doctor Strange can get action figures, cameos in other films, and even a series of films, we turn our lonely eyes to The Incredible Hulk, that MCU film that fans either pretend does not exist or are genuinely unaware of. The Incredible Hulk is not a terrible film, but it seems that its status as the illegitimate child of the Marvel Cinematic Universe, that odd quirk of this carefully-planned series, is somewhat warranted. The opening credits spell out what has happened: Dr. Bruce Banner (Edward Norton) has undergone experiments involving gamma rays which did not kill him but left him as the uncontrollable Hulk. His girlfriend Betty Ross (Liv Tyler) observed the experiments, and if memory serves correct Banner believes Betty is dead since he wrecked the place. Now hiding out in Brazil, Banner does his best to stay under the radar and not have any rage incidents that will trigger the Hulk's emergence. So far, he's been without incident for 158 days. Working in a bottling company, he is technically proficient but needs to work on his Portuguese. It isn't until one of the bottled drinks has a tiny bit of blood, with some kind of effects in America, that General Ross (William Hurt) realizes where Banner is. Off to Brazil, where an effort to capture Banner fails, even with a master soldier, Emil Blonsky (Tim Roth), leading the troops. Blonsky is intrigued by Banner's alter ego, but right now the mission is to find Banner. He in turn slips back into America, where he is in search of the mysterious "Mr. Blue", with whom he as "Mr. Green" has corresponded in an effort to find a cure. Banner reunites, reluctantly, with Betty, who has been seeing Dr. Leonard Sampson (Ty Burrell) romantically. At Culver University where Betty teaches, her father the General sweeps in to try and take Banner alive, but Hulk manages to fight off the troops. Even Blonsky is beaten hard, but the upside is that he was given a bit of the serum earlier, which probably saved his life. Blonsky however, wants more. Again on the run, Banner finally manages to meet up with "Mr. Blue", real name Dr. Samuel Sterns (Tim Blake Nelson). Sterns is a bit wacky and delighted to have "Mr. Blue" there, and attempts to get Banner treatment. However, two things go wrong: first, Ross and Blonsky manage to find Banner and Betty, and Sterns seems more interested in harvesting Banner's blood to make humans impervious to disease rather than destroying the blood Sterns has collected, which Banner insists poses danger. Blonsky, now becoming bonkers, forces Sterns to inject him with more serum, where he becomes Abomination, and it is a battle between Abomination and Hulk. Banner once again flees into the night after the gigantic Battle in New York, while in a bar, General Ross drowns his sorrows until Tony Stark (Robert Downey, Jr.) visits to tell him 'they' are forming a group. As I am not well-versed in the Chapter and Verse of the Marvel Cinematic Universe, I cannot say for certain whether or not General Ross' involvement with Bruce Banner has ever been brought up in any other MCU film where Ross has appeared. I don't think Betty Ross, Abomination or Samuel Sterns has ever been mentioned again, which makes The Incredible Hulk's connections to the large MCU all the more puzzling. The Incredible Hulk, in my view, is kind of forgotten or at least lost in the shuffle because unlike other MCU films, it isn't an actual origin story. If my memory of the other films that introduce a Marvel Cinematic Universe character (Thor, Ant-Man, Captain America: The First Avenger for example), each takes at least the first ten or fifteen minutes to set up their various worlds and give you an outline of the main character (arrogant Norse god, good-hearted thief, skinny weakling from Brooklyn). The Incredible Hulk doesn't. Instead, in a decision which director Louis Leterrier and screenwriter Zak Penn (with work from an uncredited Norton) made and whose wisdom I don't get, they decided to essentially start in medias res, with us getting how Banner became Hulk in the opening credits. Why it opted for this I cannot guess. Perhaps Marvel figured audiences already knew Hulk's origin story and decided to move further ahead. Perhaps they worried they would repeat themselves, a worry that has merit. Whatever the reason, The Incredible Hulk's decision to forgo the traditional origin story is one of its greatest weaknesses. As we kind of get thrown into things, all the aspects that the film wants us to care about: the love story, the battle between Hulk and Abomination, even hints about future Hulk-related stories, gets tossed at us without much to make us care. This is not helped by some of the performances. Tyler is weak as Betty, delivering all her lines in this breathy manner that veers dangerously close to parody. Roth is a pretty solid actor, but here he couldn't seem to decide whether to make his menace mirthful or monstrous, as if he wanted to both be serious and camp up Blonsky. It's not a slam on Roth's height, but he seems rather small to be imagined as this dangerous, powerful hitman/soldier. 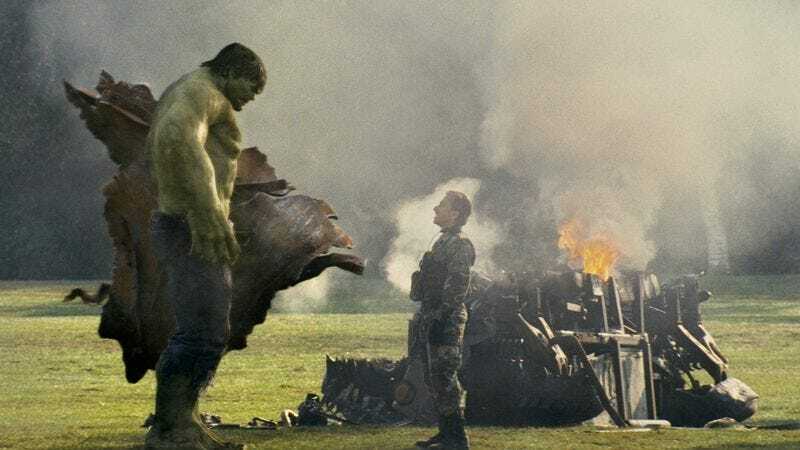 It is possible to be a short man with great killing prowess, but at one point when the 5'7" Roth stands in front of this gigantic CGI Hulk, the result is laughable. Hurt too veered between serious and silly, chomping at his cigar to comic effect. Nelson appears to be the comic relief, or at least plays it as such. Burell, who is now best known as the somewhat dimwitted paterfamilias on Modern Family, has little to do but is surprisingly strong in a dramatic turn. As for Norton, I think he is a respectable, even good Bruce Banner/Hulk. He does struggle with the few bits of comedy he's given, such as accidentally saying "You wouldn't like me when I'm hungry" in Portuguese when he meant "You wouldn't like me when I'm angry", making his delivery rather forced. However, when going for a slightly more dramatic moment, Norton manages to hold his own. Looking at it now, The Incredible Hulk seems a bit dated, especially in terms of its visual effects. It does not have compelling characters or a story that is particularly interesting. I don't think it's terrible, but it could have been so much better. The Incredible Hulk is almost the Chuck Cunningham of the Marvel Cinematic Universe: we know it exists but we never actually acknowledge it.